Deputy Frances Fitzgerald: In March 2011, the social services inspectorate of the Health Information and Quality Authority, HIQA, carried out an announced follow-up inspection of the foster care service provided by the Health Service Executive, HSE, in the Dublin North-Central local health area. The inspection was carried out under section 69(2) of the Child Care Act 1991 and was done to assess progress in implementing the recommendations of the full original inspection report, which was published by HIQA in July 2010. The findings of the first inspection identified significant shortcomings in the HSE’s compliance with national standards and regulations pertaining to foster care services, and a series of local and national recommendations was made by the authority. In 2010, the HSE provided HIQA with an action plan against the local recommendations that related to the Dublin north-central local health area. A follow-up inspection found that good progress had been made in the implementation of most of the recommendations in the original inspection report. The positive changes that had taken place included an increase in the number of social worker posts in the area, a reduction in the number of unallocated cases and improved local systems of gathering and maintaining information and care records. Seventeen new social worker posts had been allocated and all of the posts were filled. The inspection found that the provision of supervision to social workers had improved. Other positive changes were related to improved governance of this service and the considerable efforts to ensure social workers carried out their duties in accordance with foster care standards and regulations. However there continued to be children in foster care and foster carers in the area who did not have an assigned social worker. Delays in the assessment and approval of relative foster carers continued, and the Children First guidelines were not being complied with totally. These findings were of particular concern. However, the HSE is working to address the deficits in Dublin central. The 17 additional social worker posts that have been filled will help us to complete the assessments that are outstanding. Further work must be done to ensure all children in foster care are assessed and have a foster care plan. The HSE will be closely monitoring this work at local and national level and will report back to my Department on it. Deputy Maureen O’Sullivan: Children deserve to be protected in an environment where they feel wanted, secure and comfortable. Such an environment is not available to many children in the north inner city because of the area’s drugs problems. Some of them have seen their parents die, sometimes through suicide, or continue in addiction. Many of them are being cared for by their grandparents, who have taken them in with an heart and a half despite the additional strains involved. I accept the Minister’s assurances on the overall report but these grandparents need support. I acknowledge the tireless efforts of family support workers, many of whom come from the area. If the supports are not provided now there will be an increase in the numbers of children looking for places in Ballydowd or additional services when they reach adulthood. What exactly is being done to address the issue, other than the 17 additional posts? What can be done for these grandparents? Deputy Frances Fitzgerald: The deficiencies in the system are being addressed. We are increasing the number of cases assigned social workers beyond the 88% of cases identified in the report. The assessments are ongoing. Clearly the level of family support required cannot be determined without assessments. If the Deputy wishes to bring individual cases to my attention or discuss them directly with the local HSE office, I will be happy to facilitate her. We are funding a range of family support services at the voluntary and statutory level to provide the supports these families require. An audit of alternative care services is being finalised at national level. This will provide valuable information about the demand for alternative care services. I pay tribute to foster parents. We are fortunate that the vast majority of the 6,000 children in care are being looked after by experienced and caring foster parents. Sometimes we forget about the good work being done when we receive reports that highlight deficiencies. I also acknowledge the work being done by children’s extended families. Deputy Maureen O’Sullivan: My concern is for those who have not yet been approached. Perhaps they will all be approved. I have been involved in the young people’s facilities and services fund since its establishment in the late 1990s and I chaired the group for the north inner city. It does great work for the capital money it receives. I welcome the provision of a small grants fund this year. This funding went a long way in the north inner city. In view of the impact of drugs, would the Minister consider engaging more directly with the existing structures of the national drugs strategy? Deputy Frances Fitzgerald: My Department funds a number of projects targeted at families with drug issues. That will continue in the coming year. I am reforming the funding provision for youth groups to allow greater flexibility in grant applications. _I will return to the micro from the macro, where we were for the past while, merely to make the point that this budget hits certain persons severely and totally disproportionately to other sections of society. 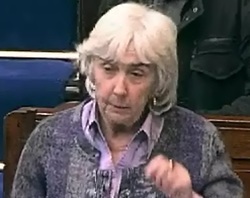 I consistently state and totally believe that persons with disabilities, persons with mental health issues and their carers should be sacrosanct when it comes to budget time and they should never have an additional worry or stress that anything will be taken from them or add to their particular burdens, and that is the purpose of my amendment. In the past couple of days, I visited three different DEIS schools in Dublin schools which, if the proposals are given effect - it appears from the Minister for Education and Skills that they will - will be totally decimated. They will lose large numbers of teachers, more than any other school in the country. They will lose the resources that have made such a difference to those young children and that have brought them nearly onto a level playing field with others so that they can realise their potential. Many of their parents are carers. Many of them depend on family income supplement. One gets to the point where there is only a certain amount that one can get out of a social welfare payment and it is impossible to expect an additional payment to be taken out of that. These are people with limited means. They are being hit totally disproportionately with what has been happening in the budget. They definitely need to be exempted and I hope that amendment is supported. Acting Chairman (Deputy Thomas P. Broughan): Deputies Joe Costello, Derek Keating, Maureen O’Sullivan and Alex White, have four minutes between them. Deputy Joe Costello: I hope the Acting Chairman will be flexible as regards the time.The concerns of relatives and staff in Grangegorman are now public as a result of media attention such as on “Liveline”. Five women are being transferred from an open unit in Grangegorman to a closed, secure unit. Voluntary patients are moving to a ward for involuntary patients. This is contrary to all best medical practice. These are low risk patients who are being moved into what would have been regarded as a medium to high risk unit. A number of these patients have been in the unit for a considerable period of time. They are familiar with their surroundings and have formed friendships and have decorated the unit for Christmas. The reason for this significant change in their situation is because of a shortage of staff. This is a peak holiday time and there is an embargo on recruitment in the public sector. The staff are very committed and are to be commended, and a new, state-of-the-art unit will be built next year. However, a current significant bottleneck needs to be addressed. The solution is to provide the staff cover through the use of overtime or agency staff. Another seven patients in the unit were transferred to hostel accommodation on the North Circular Road and in Fairview or to other units. This could be an alternative for the remaining five patients or else the embargo on staff should be lifted to allow for the provision of ten extra staff required over that period. I ask the Minister of State to address the situation. Deputy Derek Keating: I am absolutely furious at the way this matter is being handled by the HSE and its treatment of these patients. I am of the view that this is possibly illegal and it is certainly immoral. It is completely unprofessional to lump five women into a unit which already caters for six patients. During the period of their incarceration they will have the use of a single toilet. Part of the difficulty is that Unit O, where these patients are being incarcerated, is a locked unit and the Mental Health Commission previously deemed this unit to be unsuitable and not fit for purpose. These five patients are being told they cannot use their mobile telephones during the Christmas period. I wonder who made this decision. Are these women five patients or five prisoners? From my voluntary work over the years I know how important matters such as a routine, consistency and familiarity are for patients undergoing treatment and in particular for those undergoing mental health treatment. The Mental Health Act 2001 has two main features, the promotion and maintenance of quality standards of care and treatment which are regularly inspected and properly regulated. The primary function of the Mental Health Tribunals established under the Act is to ensure the protection of the rights of patients detained involuntarily. These five patients, in my view, are being detained involuntarily. If a person is detained and treated in a hospital against his or her will, this is not complying with human rights. If this is the case, the Mental Health Act must be urgently updated and amended. The information that patients are being moved from their home, Unit 3B, to a locked unit is completely unacceptable. I ask whether this action contravenes the Mental Health Act. In advance of any Dáil question I will table, I ask who made the decision and on what basis. Was a consultant involved in the decision? Could this action result in a complaint to the Medical Council if this decision was endorsed by a consultant? For the sake of a paltry few bob, I ask the Minister of State to direct the HSE to provide staff for the welfare and comfort of these patients in their own unit during the Christmas festivities. I am very conscious that we have a caring a Minister of State with responsibility for mental health and disability who has inherited the restricted circumstances from a previous Administration. I ask her in the few days leading up to Christmas to ask the HSE to exercise some flexibility. Deputy Maureen O’Sullivan: I too am appalled at the situation in Grangegorman for very vulnerable people and their loved ones. Eleven long-term patients from Unit 3B have been moved. The most focus has been on those who have been moved into Unit O but others have been moved to hostels and other accommodation. The bottom line is the moving of these patients. They are used to their familiar environment and the move is very distressing and disturbing for them. They have mental health issues and I am aware of the Minister of State’s interest in that area. There are issues for those already in Unit O whose space is being taken over by the new residents and also issues for the residents of Unit 3B. A health and safety issue arises in both areas for both patients and staff and it is also a human rights issue. Deputy Alex White:This is a very disquieting situation. As well as having been contacted by concerned family members, I have also had an opportunity to speak to some of the professional staff involved. Deputy Keating has raised this issue briefly but from my knowledge of their views they are just as appalled and dissatisfied at this decision and its implications. As Deputy Maureen O’Sullivan has said, it runs the risk of seriously compounding the anxiety suffered by these five women at the best of times. I appreciate the Minister of State’s commitment to this area and I do not doubt it for one minute. This is clearly an issue of resources and if the decision is to be reversed on 16 January 2012, it means a solution will exist on 16 January. It may be naive of me to ask the Minister of State but I ask if it is possible to bring forward what will be done on 16 January to 13 December, considering the status quo will be reversed in the middle of January. Surely there is some possibility of this being addressed in a way that can solve it for this short period of four weeks. I ask the Minister of State, knowing her commitment to this entire area, to consider this option. The decision to use a locked or a semi-locked ward is completely the opposite direction we should go. It is completely unacceptable that we should have to take that step at this stage of our development. We should be going in the opposite direction and I know this is the long-term commitment of the Minister of State. This is a bad and a retrograde step and I hope the Minister of State can do something to have it reversed. Acting Chairman (Deputy Thomas P. Broughan): I have allowed some flexibility on time because of the importance of this matter and I will allow similar flexibility to the Minister of State. Deputy Kathleen Lynch: I thank the Acting Chairman. The extra time is much appreciated as this is a very difficult issue to deal with in a short timeframe for a reply. To respond to Deputy White’s final question on why a solution could not be found immediately if one will be found by 16 January of next year, the difficulty is that the staff needed will not return from annual leave until 16 January. There is little we can do in the circumstances. At present, 37 staff are absent in the units in question as a result of maternity leave and sick leave and because a number of those who will retire in February will avail of the accumulated leave to which they are entitled. We must accept this is the case, especially given the extraordinary job performed by the staff in question. I am not sure any of us would do their job. I am pleased the House is discussing locked units, an issue that was well ventilated recently when we discussed a Private Members’ motion tabled by Technical Group. Locked units are from a bygone era, although in some cases people who have emotional episodes need to be protected from themselves and, in rare cases, members of the public need to be protected from individuals. Specific units are in place to deal with such cases. The use of locked units, especially dormitory style units, flies in the face of our mental health strategy, A Vision for Change, and everything that most Members believe in. It is highly regrettable that the action being taken has become necessary, particularly at this time of year, and I completely understand the distress the decision has caused patients - if that is the correct term - their families and the general community. The Health Service Executive informs me that the measures are necessary given the shortage of nursing staff in Dublin north west mental health services. Dublin will not be the only area that will experience shortages in future. There was a large number of retirements this year among nursing staff in St. Brendan’s Hospital and vacant posts were not filled due to the recruitment pause in place in the HSE. Unfortunately, therefore, the executive has been left with no option but to devise a contingency arrangement to ensure both patient safety and continuity of services over the Christmas period. It is not the case that I have only recently become involved in this matter. I have been making inquiries about since before last weekend and the issue must be dealt with in future. To address Deputy Keating’s concerns, the Mental Health Commission has responsibility under the Mental Act 2001 to take all reasonable steps to protect the interests of detained patients. I understand the Health Service Executive has notified the commission of the measures proposed. The Mental Health Commission has responsibility for ensuring the units in question have sufficient staff to provide a safe environment for those who are detained at St. Brendan’s Hospital and its staff. Despite our efforts to have people receive mental health services in the community, an approach that keeps them well and prevents them from being admitted to hospital, some of them are being called into acute units. It is perverse that people in the community are becoming unwell and require readmission to hospital. This issue will form part of the review of the Mental Health Act. The position is that, following clinical assessment, it has been decided to transfer the 12 long-stay patients from Unit 3B. Five have been transferred to Unit O, four to community hostels and the remaining three to other facilities. However, I have been assured that this is purely a temporary measure and Unit 3B will reopen on 16 January next, if not earlier. Concerns in the media largely centre on the transfer of five women to Unit O, which is a low secure ward that has a locked door policy in place. I have received an assurance from the Health Service Executive that patients from Unit 3B who previously could move in and out freely will still be able to do so. This is fully in line with our national mental health policy which seeks to ensure patients are held in the least restrictive environment possible. Concerns have also been expressed that patients in Unit O have access to only one shower. Again, I am assured that there are two showers available to patients. While I know this is far from ideal and I am acutely aware of the infrastructural deficits at St. Brendan’s Hospital, the closure of the hospital is foreseen in the context of the implementation of A Vision for Change. Those who are familiar with the facility will be aware that the reduction in its patient population is proceeding at a steady pace. Acute admissions have ceased and the hospital now provides only continuing care to long-stay patients who are the women affected by the recent decision. I am pleased to inform the House that construction is under way on a 54 bed replacement long-stay facility as part of the Grangegorman redevelopment project. Building is expected to be completed in 2012 and the new facility will provide patients with their own single bedrooms, en suite facilities, therapy and rehabilitation spaces, in other words, the types of facilities we should have been providing years ago. I am confident patients will have moved into the new facility before next Christmas, although I accept this will be cold comfort to patients in Unit O. Again, I express my regret that these measures were necessary. Budget 2012 provided an additional €35 million for mental health services which will be used to provide additional posts in the community. I hope people will never again be locked up for 20, 30, 40 or 50 years. I visited a locked unit in which one person who clearly did not present a danger to anyone had resided for 60 years. The additional funding will enable the HSE to enhance the multidisciplinary composition of community mental health teams and focus on key priorities in mental health. There is, however, a need to explore more fully how mental health services, owing to the age profile of staff within the service, have been impacted disproportionately by the staff moratorium. This issue is already the subject of discussions between officials of my Department and the HSE and I intend to pursue it further to achieve an appropriate result which ensures the quality and safety of our mental health services in the future. The blunt instrument of the moratorium will not serve us well in mental health. For this reason, we must closely examine the areas in which we most need staff and how they can best be provided. Discussions will have to take place on this issue because staff will be lost in areas in which they are needed and retained in areas where we could do without them. I appreciate that the Acting Chairman, Deputy Broughan, has allowed me considerable latitude. Acting Chairman (Deputy Thomas P. Broughan): I allowed an additional five minutes for discussion of this important topic. However, as other Deputies have been waiting to speak on other topics, I ask Deputies Costello, Keating, O’Sullivan and White to confine their contributions to putting a single question to the Minister of State. Deputy Joe Costello: While I appreciate the Minister of State’s remarks on the additional €35 million in the budget and new proposals regarding the facility in question, we face a real and immediate crisis which is completely unacceptable. We may find, as a result of the recruitment embargo and forthcoming retirements in February, that we still have staffing shortages on 16 January. While this matter is being addressed, will the Minister of State make arrangements to allow the Deputies who have raised this issue to visit the unit in order that we can see where the women in question are being placed? I know such a facility resides with the inspector and ask the Minister of State to make the appropriate arrangements. Deputy Derek Keating: I acknowledge that the Minister of State’s heart is in the right place and I have no doubt she will make a significant contribution to mental health services in the lifetime of the Government. Does she not have the power to direct the HSE to resolve this single sensitive and critical issue for five human beings at Christmas time? Deputy Maureen O’Sullivan: I presume additional staff went into the other unit because additional patients were there. Given that this is Christmas time, and in light of the stressful nature of this issue, can the Minister of State not use some of the €35 million to resolve this difficulty? I understand some of the families are also willing to contribute. Deputy Alex White: I was about to ask the same question. Is it not possible for the HSE to secure the services of temporary staff for this short four-week period? I understand what the Minister of State has said. I would not for a moment wish to trespass on anybody’s right to take annual leave. If we accept that the response we have been given - the posts lie vacant and cannot be replaced - is accurate, does the HSE not have some flexibility to hire staff for four weeks? Acting Chairman (Deputy Thomas P. Broughan):I ask the Minister of State to conclude. Deputy Kathleen Lynch:I appreciate the Chair’s patience. I can inform Deputy Costello that I have already made a request to be allowed to visit the unit. I have been told it is not a difficulty. I did not make a similar request on behalf of other Deputies. I will make such a request and revert to all the Deputies in question. I assure Deputies O’Sullivan and Keating that people on overtime and agency staff are already working in the unit. I have been informed by the HSE that the difficulty is that it is better to have staff with whom the residents of the unit are familiar, rather than people who are not known to them. It is very easy to understand that point. The HSE has assured me that it has asked people to do a little extra work over Christmas. It is natural and understandable that people are reluctant to work during the Christmas holidays. I am in regular contact with the HSE. If it agrees to a visit by the Deputies when I contact it again, I will contact them. Many of the measures introduced today will have a cumulative effect on low-income groups when considered not only in the context of the spending cuts announced yesterday, but also the impact of previous Budgets. [It is often overlooked that this is not the first austerity budget.] By the same token, some of the more progressive measures announced today, such as the rebalancing of USC, will be offset by the impact of yesterday’s spending cuts on low income households, some of which may still find themselves worse off. This reinforces TASC’s long-standing recommendation that all budgetary measures be subjected to equality-proofing prior to implementation, and equality auditing after implementation. That is the crux because it is not a budget in which the citizens of the country are being treated equally. The First World War poet, Siegfried Sassoon, wrote a wonderful poem, Base Details, which contains an analogy for us. He referred to the generals “Guzzling and gulping in the best hotel,” who then “toddle safely home” to their beds. While we are not talking about generals, we have their equivalent - the very wealthy, the high earners, the executives and the directors who work in the State, semi-State and public sector, banks, universities, public life and the private sector. They are not hurt by the budget and will not be struggling. They will go on with the guzzling and gulping and it is a case of carry on regardless for many of them, whereas certain sectors of society have been hurt very badly. The other group mentioned in the poem were the young heroes who were being sped along the line to their deaths. While I trust that nobody will die because of the budget, there is such a thing as a metaphorical death. Some will suffer disproportionately. The pain caused by the budget is disproportionate because it will increase inequality. I accept that there are positive aspects for senior citizens whose pensions, free travel pass, free television licence and living alone allowance are untouched. However, the change in the eligible period for fuel allowance will cause a problem. Perhaps the shorter period might be sufficient, but it is part of the psychology of old age that there is a fear that they will never have enough. That fear will prevent them from using the fuel initially to keep it for a time when they might just need it. Of course, they are very susceptible to the cold and there is a real danger that they will become ill or, worse, suffer from hypothermia. As Deputy Catherine Murphy said, this is happening at a time when gas and oil prices are rising. There are other positive aspects. Basic social welfare payments will remain the same, including jobseeker’s benefit, blind pension and one-parent family allowance. I accept what the Minister said about working families, but the tax system is not fair. The high earners - there are many - should be paying a higher rate of tax. The community sector is being further eroded. This is the sector that provides the services and support for many vulnerable people and there has been an increase in demand for its services. Yesterday I mentioned Brother Kevin of the Capuchin Day Centre which two years ago gave out approximately 400 food parcels each morning; last week it gave out 11,000 on one morning. The Wheel organisation highlights how the other cuts will have a cumulative effect on those dependent on social welfare and low incomes. It points out that the increase in VAT will result in a considerable loss of income to charitable organisations which cannot reclaim VAT. Community employment schemes are facing major cuts in the training grant - a 66% cut in operating budgets which will have a detrimental effect on the delivery of vital programmes in education, parenting, child care, vocational skills, after-school services, services for the elderly and the disabled, and drug rehabilitation, as well as the giving of work experience. Many participating in community employment schemes are early school leavers, persons who got caught up in addiction and are homeless. Through the schemes they are given an opportunity to learn and develop new skills. They become involved in developing literacy and numeracy skills on which they missed out when they were younger. Many use the schemes as a first step on the ladder towards further education. New participants will not be able to claim other social welfare payments at the same time and it was those other payments that enabled them to avail of the schemes. My experience of the schemes in the north inner city has been very positive because they have made a real difference in people’s lives. I would hate to see those participants opting out or projects closing because of these regressive measures. The projects work with extremely vulnerable individuals. Some of the projects provide a lifeline and coping skills. Without community projects, there will be further severe pressure on health and social services. The youth and drugs projects have coped with the cuts to date - some might manage with this cut, but others will fold. It is very difficult to reconcile what each of the Ministers is saying about increases announced in budget when we know the position on the ground is very different. I supported the increase in excise duty on cigarettes and would have supported an increase in excise duty on alcohol. The sale on the streets of Dublin’s inner city, and I am sure other areas, of cheap alcohol, cigarettes and illegal pills is leading to shattered lives and communities. Alcohol Action Ireland maintains that an increase in excise duty on alcohol would have raised an additional €186 million. We all know what could have been done with that. I welcome what has been said in regard to disability payments. However, as I have stated repeatedly, people with mental health issues and disabilities should never have the added stress of worrying about their allowances being cut in a budget. I do not believe any humane government would consider doing so. There are people with disabilities and multiple disabilities who will never work but need and are entitled to an allowance that will enable them to live in dignity. While many landlords take their responsibilities seriously, parts of Dublin central are plagued by irresponsible, unscrupulous landlords who charge rents that are completely disproportionate to the type of accommodation they offer. They are flouting all health and safety measures and are leaving people in vulnerable situations. Any initiative to deal with that would be welcome. Budgets are about choices. There is a great deal of anger, frustration and hurt out there because of the choices made in this budget. _I very much support the Private Members’ motion that we are not forced into fiscal union at the summit in Brussels and that the Taoiseach should refuse to sign up to any treaty changes which hand over our economic sovereignty. When he addressed the nation on Sunday, he said he wanted to be the Taoiseach who retrieved Ireland’s economic sovereignty. We are all witnesses to that and I hope that statement does not get diluted in any way. I admit to never being a supporter of being in Europe. I voted against the Nice treaty and the two Lisbon treaties. I have always felt there were threats to or an undermining of our identity, independence and our capacity to manage our own affairs and that we were very much leaving ourselves at the disposal of the Goldman Sachs of this world. Certain sections of society did very well out of the EU. We know of the billions of euro that went to the farming sector. The IFA would say that many of these payments were between €12,000 and €14,000 but massive amounts of money was provided. The Greencore Group received €83 million as a result of exiting the sugar business. Was that really a good move? Billions were received from the structural, region and cohesion funds but many structural projects came in grossly overpriced - again, a waste of money. In the main, the fishing industry has been decimated. Would we have been better off staying out of the eurozone? If we had not joined, would we be in this dire economic situation? Some economists believe that the euro facilitated the crisis, as Irish banks could borrow from other eurozone banks without exchange risks and lend that money on to customers. According to these economists, our membership of the EU removes the cap on bank lending and halves the cost of borrowing, resulting in a significant increase in the availability of credit and the halving of interest rates. According to one journalist, “This was the economic equivalent of crack cocaine.” The property market suffered considerable repercussions. Had we stayed with our own currency like the UK, Sweden and Denmark did, we might be on the other side of the recession. When the global credit crunch struck in 2007, we might have had a solvent Exchequer and banking system. This would also have depended on having men and women of integrity and with the common good at heart in decision-making positions in banks, finance and public office. Consider Europe’s history. Without being too simplistic, the two world wars were caused by aggression on the part of certain countries. Two countries that were bitter enemies are driving this move. As Arthur Beesley wrote in The Irish Times, “Angela Merkel and Nicolas Sarkozy take lunch together in Paris, the rest of Europe looks on for clues as to where they will lead us next.” Is this democracy àla the EU? Do we really believe that they have Ireland’s best interests at heart? Perhaps they do, but no doubt it will only be if doing so is in the better interests of Germany and France. Those who are making a profit out of our misfortune are gaining from our bailout. It seems to be the case that, unless France and Germany give us their sanction, this will continue to be the situation. We have the added spectre of the European Court of Justice, which has the power to assess whether national budget rules comply with a country’s European obligations. The possibilities are treaty change, a Schengen-type solution for eurozone states, enhanced co-operation under the Lisbon treaty, tightly focused economic governance, a major revision of treaties and a federal approach. While I am not an expert on economics, it seems that national fiscal policies will need to be deliberated on with partners and there will be penalties for those who breach the agreed benchmarks. “Save the euro” is the mantra. Perhaps this is right, but Ireland cannot and should not allow itself to be scared or bullied into sacrificing its economic, political or fiscal independence. There is a danger of being relegated to an inferior or subordinate position under the more dominant states. According to Germany, greater fiscal consolidation and control by national governments will ensure the continuation of funds from the new European Stability Mechanism, ESM, and possibly the ECB, but Ireland would not be in control of its budget and would face further fiscal penalties. We must defend and maintain our democracy and not allow it to be dictated to by the markets. We must prevent a scenario in which smaller, weaker European states have no input and become marginalised and where further fiscal discipline will plunge us into a deeper recession. We have seen the effects of an austere budget, but we must reach a point at which we can make decisions with the common good of this country at heart. Perhaps Iceland and Argentina can teach us lessons. _I listened to the budget speeches delivered by the Minister, Deputy Howlin, and the Minister, Deputy Noonan and, as usual, I listened with an open mind. Because I am on this side of the House does not mean I will automatically disagree with everything I hear from those on the other side. There seemed to be principles around which the budget would be based, namely, fairness, reform, social inclusion, protecting the most vulnerable, dismantling barriers to employment, openness, transparency, accountability, ensuring a fair distribution of the tax burden and to get Ireland working again, all of with which I agree. It appeared we were moving in the right direction towards a more equal society, but it was a different story when it came to the small print, the further details in the comprehensive expenditure report and the budget. It is difficult to reconcile those principles with what is contained in those two documents. They both seem to be guided by so-called “obligation to pay €1.25 billion to unguaranteed senior bondholders” while many cuts are being imposed that will hurt the poor and the vulnerable. I read an article by Brother Kevin of the Capuchin Day Centre in Dublin which feeds several thousand homeless people in this city. He made the point that two or three years ago the centre gave out approximately 400 food parcels of a morning; last week it gave out 11,000 on one morning. I share his concern that the Government will penalise the underprivileged.If we continue with the payment to bondholders, could we not at least tax the transaction of the transfer of the money? This group of bondholders are earning money, so they should pay tax or at least give a percentage back if the Government is to continue paying them. After all, the bondholders are getting all this money but they are certainly not creating jobs. Multinational companies and very large Irish companies have set up businesses here. They can transfer profits to an Irish company in a tax haven with even more liberal laws than we have. Again, at a minimum could we not impose a tax on transactions transferring this money? This brings me to the issue of corporate tax. Could we at least ensure the full 12.5% is collected? It is difficult to get specific information on this. I tried to find out exactly how much corporate tax TalkTalk in Waterford paid but without success. Seemingly it was worth €3.9 billion in 2009 and that is when it was not all being collected. Some multinationals pay, on average, between 4% and 7% corporate tax here. I spoke on this issue in the last Dáil and I was the only person with any reservations about corporate tax. My concern is that we have become a tax haven for countries that do not pay their just taxes in the country of origin and now we are also allowing companies to avoid paying their just taxes in this country. Turning to education, I thought it was great that the pupil-teacher ratio was being maintained but I received telephone calls from five junior primary schools in Dublin Central who will all lose teachers in the next few years. They will lose their support teachers and a few of those schools will lose that special teacher who deals with students with emotional distress. They face a dire situation. Those schools were fortunate in having quite a number of additional programmes which greatly benefited the literacy and numeracy skills of their students but that is now being undermined. There are no reductions in the overall number of special needs assistants and resource teachers, but fee paying schools are still being funded disproportionately compared to schools in disadvantaged areas. Having worked as a guidance counsellor as well as having taught a subject, I know the work of a guidance counsellor very well. In a sense all teachers have a guidance role because teaching is not only about imparting knowledge or skills but about the well-being of the student. The guidance counsellor has a particular role. There was a battle to get the position ex-quota with an allocation for schools with under 500 pupils but that is now lost. The Government can dispense with guidance counsellors if the Department can provide the support services that every school needs to deal with the problems, behaviours and the issues presented by students. Schools do not have the services of psychologists, therapists, counsellors, career advisers and support groups; the guidance counsellor provides an invaluable service in that regard. With the plans for guidance counsellors, extra pressure will be put on schools. In practically every school I know the students are under additional emotional stresses and psychological distress, and they are now being abandoned. Yet we continue to go along with the quango of the Teaching Council and I have yet to meet a teacher who considers the fee of €90 a year to be value for money. I welcome the capital programme, that schools will be built and that plans are being made to accommodate extra students. I hope that Gaelscoil Bharra which has operated from prefabs for many years will finally get the school that has been approved. I cannot understand how a government would target a cut at any person with a disability, regardless of his or her age. It is most inhumane. I have said consistently that those with mental health issues, disabilities and their carers should not have an additional stress regarding the budget. They should be sacrosanct and I welcome that the Government is re-examining this. However, it should not have been in the budget in the first place. There are people with severe disabilities and multi-disabilities who will not work and they are entitled to an allowance that will permit them to live in dignity. Losing €88 a week and €44 a week is very significant for these groups. The cuts in grants for community employment schemes will have detrimental and disastrous effects. These grants were used for materials and training to facilitate the delivery of courses in personal development, education, parenting, after-school services, services to the elderly and the disabled. Many on these schemes were early school leavers who got caught up on drugs or were homeless. The community employment schemes were a real way for people to train and acquire skills and were an opportunity for second chance education and to acquire literacy and numeracy skills. Many people have used it as a first step on the ladder to further education. The effect is that lone parents or those with a disability allowance will not be able to keep their allowances if on a community employment scheme. Yesterday, I attended a lunch for senior citizens who were generally optimistic. They stated that they were prepared to take their cut, but the fuel allowance is a serious matter because they fear they will not have enough and this is causing distress. They will hold on to what they have in the fear that it might run out and this is causing many problems for them. I voted in favour of the increase in excise duty on cigarettes and I would have supported an increase in excise duty on alcohol to address the availability of cheap alcohol. Every report, committee, community, health service and addiction service is in favour of this. Cheap alcohol, illegal cigarettes and regulated tablets are leading to shattered lives in Dublin’s north inner city. Alcohol Action Ireland states that an increase would have generated €178 million. I welcome the additional €35 million for mental health services to further advance A Vision for Change with the emphasis on eating disorders, early intervention in psychosis and suicide prevention including self-harm, which are areas which have long been neglected. I hope the HSE will take on the good practice of organisations such as Pieta House, the Oasis Deora project, Bodywhys and the eating distress counselling service in Fairview. I do not think the budget was fair and this is the bottom line. Deputy Maureen O’Sullivan:It is rather strange to discuss private health insurance. Whether the legislation is necessary is one thing but a great deal more is needed in our health service. Many people have believed in and purchased private health insurance. I did too, many years ago. One sometimes asks oneself why one did so. It has nothing to do with our health system or the quality of our health service but with accessing that system and having faith in being able to access it. That is the reason so many people have opted for private insurance. The aim is to access treatment speedily. According to the Minister’s speech last night, almost half the population, 47.5%, have private health insurance in one form or another through inpatient plans. Of course, the VHI has the bulk of this business. The numbers are decreasing but it is still a significant amount. In 2010, €1.9 billion was spent on premia, a 19% increase on the 2008 figure. There is still plenty of money about. On the one hand, private health insurance takes pressure off the public system, but it is based on unfairness and the fact that payment will secure quicker access. Payment will get the scan and quicker access to the consultant and secure the private or semi-private room. I cannot but be aware of the system in the private hospitals. When one gets a time for an appointment, it takes place at that time and when one gets a date for a procedure, nine out of ten times it will happen on that date. Patients generally do not have to go through our chaotic accident and emergency system unless there is an emergency. Now, money can pay for the various clinics catering for minor ailments, broken limbs and so forth, and the waiting time is minimal. I do not understand why our public system cannot provide the same efficient service. We have excellent doctors, nurses and other personnel. There have been some very good developments with the breast screening and cancer services, but there are major problems. In 2004 the then Minister for Health stated, “The one thing I want for the country I love is to have a health service that is accessible to every citizen, regardless of his or her wealth”. That Government had seven further years in office and I do not believe progress was made in that regard. We have a two tier health service, with access based on ability to pay rather than need. We need a fair and equitable health system. The programme for Government states that this Government is the first in the history of the State that is committed to developing a universal single tier health service, which guarantees access to medical care based on need, not income. Within the programme there are ambitious plans to radically change the Irish health system and to provide for equal access, universal health insurance, which will be compulsory whether it is with private or public insurance. That is the plan but in the meantime the reality is very different. There is immense pressure on the public health system. We are aware of the waiting lists and yesterday the Minister of State and I attended the briefing on the mental health service, so we know what is happening in that area. People are dying unnecessarily. I pay my private health insurance and because I am healthy, thankfully, and have not needed to use it more than once or twice, my good health is benefitting those in the private system. However, it is not benefitting people generally. The system must be more equitable. The Bill seeks to regulate the health insurance market and the area of risk equalisation. The Supreme Court judgment found that risk equalisation was not maintaining what was termed “the common good”. I believe the common good, in broad terms, means having a health system whose core principle is the common good of all, not just the good of those who have the ability to pay for it. We need a fair and equitable health system, with equal access available to everybody and not based on ability to pay. The Bill refers to all consumers, without differentiation being made in respect of age and health status. There should be no differentiation within the health system. We must look to the common good for all of our society.